I’m partial to Valentine’s celebrated in. Like I mentioned in my last post, we usually order in or make something nice rather than have to deal with the craziness of going out on Valentine’s night. Last time, I shared one version of a Date Night In with a cheese and charcuterie spread. This post will be a home cooked version of Valentine’s night in, just in case you were waiting for the weekend to celebrate. I think there are a couple of things to consider when creating a meal for a romantic evening. It shouldn’t be fussy or complicated. It also should be on the lighter side. Being all stressed out or too full and weighed down works against you later on in the evening romantically speaking. *Wink, wink. * The recipe I created today is ready in less than thirty, stress-free minutes, and it’s beautiful and elegant. Of course, the wine should reflect the mood as well; the wines of Saint-Amour literally have love written all over them. What’s in the bottle grooves with the mood too. The wines tend to be light, floral, full of spiced berry flavors, and lots of minerality. Saint-Amour is one of the ten Beaujolais Crus. I discussed three of the other Crus in this previous post. See that post for more detail about the region as a whole, but here is a quick recap. The grape of Beaujolais is Gamay, which might best known for making fun, fruity light Beaujolais Nouveau. The ten Crus, however, are communes that have established a reputation for quality and each has its own personality. 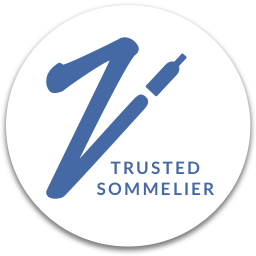 These wine are less likely to rely on carbonic maceration (or it’s used on a smaller percentage of the wine) and are more likely to be made in a classic Burgundian style. Across the board, the Crus tend to make really wonderful, food friendly wines, that are definitely worthy of serious exploration. 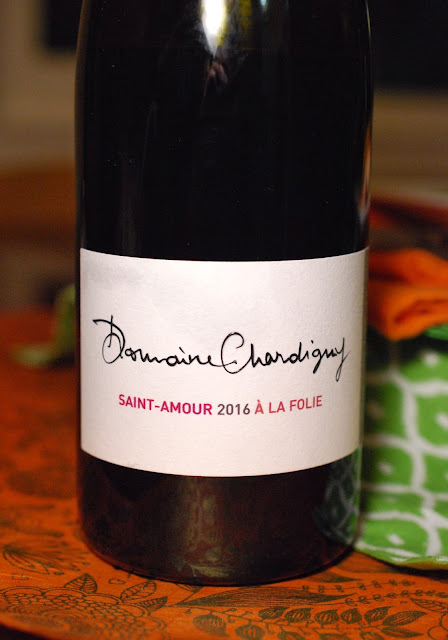 I first tried the Domaine Chardigny Saint-Amour A la Folie 2016 when we poured it for a tasting at Bay Grape and I knew it would be perfect for a Date Night–it smells like a lovely bouquet! The day I opened it at home with Greg we picked up lots of raspberries lightly spiced with white pepper and cloves and violets on the nose. The berries and spice continued on the palate and were joined by cherries and floral potpourri, as well as a stony core. It was medium bodied, with bright, medium plus acidity, and a really light tannic grip. Even though this wine is medium in weight, it really opened up with time–the fruit got rounder and more supple. Given that medium body and the light tannins, this seemed like a great red wine candidate to pair with fish, which automatically helps to keep the whole dish light. We opted for salmon, since it is a bit meatier. 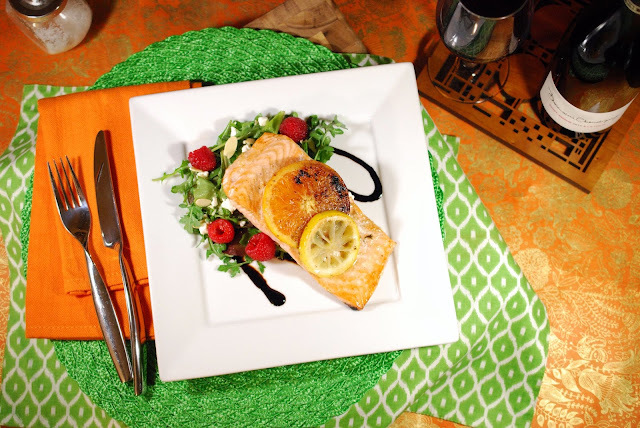 Alongside the salmon, I decided to serve it with a green salad adorned with raspberries, as well as almonds and goat cheese. I added a pinch of clove and white pepper to the dressing to bring out the spice notes in the wine. 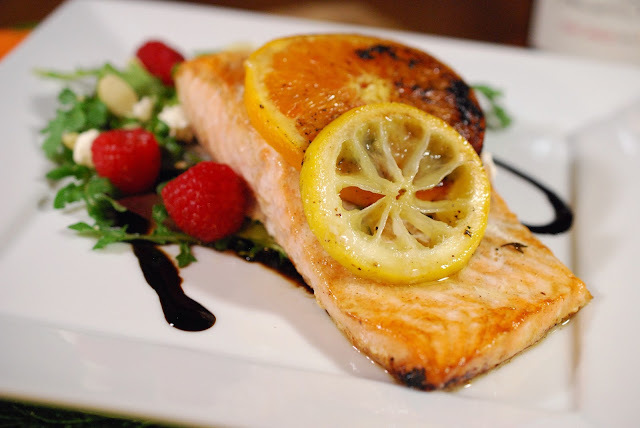 The salmon preparation is based on a recipe by Mark Bittman that I absolutely love for its simplicity and deliciousness. Roasted citrus adds brightness, while butter adds richness and it’s so incredibly fast and easy! I also added a little bit of balsamic glaze (purchased ready-made at Trader Joe’s) to perk up and add brightness to the food. It did just that, however, I will say that the vinegar shuts down the flavors in the wine. Use it sparingly as a garnish and mix it in with the rest of the food to keep it from flattening out the wine. Altogether, it was a fresh and easy pairing. It comes together without breaking a sweat, won’t leave you feeling weighed down, and worked beautifully together. Saint-Amour got its name from the legend of a Roman soldier who converted to Christianity and escaped death. He started a monastery nearby and was later canonized as Saint Amateur. Amateur means “lover” in French, but without the romantic/sexual bent. Nonetheless, as you can probably guess, the wines of Saint-Amour gets really popular right around Valentine’s Day. Saint-Amour is one of the smallest Crus and it’s also the furthest north–it’s just south of Pouilly-Fuisse and Saint-Veran in Burgundy. (It actually even overlaps area a bit with Saint-Veran.) Despite being so far north, it has a few things going for it that actually help the grapes in this area ripen more easily than in some of the Crus further south. There are hills to the west that help to block the area from heavy weather systems. Warms winds arise from the hilly area that help keep the grapes dry and disease free. Saint-Amour itself if also pretty hilly, and those hills help position the vines to get maximum sun exposure, which helps ripen those grapes. Domaine Chardigny is a family owned vineyard with a long history. Brothers Pierre-Maxime and Victor-Emmanuel Chardigny took control in 2014 and immediately set about converting the vineyards to organic farming–the family was already farming sustainably. Victor is the youngest brother. He got a degree in Enology and Viticulture and now oversees the vineyards and winemaking. Pierre-Maxime is the oldest brother and has a business degree, so handles that side of the operation, but also works in the vineyard and cellars. There is also a middle brother–Jean-Baptiste–who isn’t currently working on the family business because he’s managing the Macon vineyards over at Domaine Leflaive. So there is some serious winemaking talent in the fam. This wine is matured in a combination of concrete, stainless steel, and neutral oak barrels. The suggested retail price on this wine is $26 and it makes a beautiful Date Night Wine not only for it’s ideally named area of origin, but also for it’s beautiful aromatic nose and bright palate. This wine should be pretty versatile and would make a great choice when dining out and need to accommodate multiple and diverse dishes. Beaujo Crus are a go-to for this purpose. 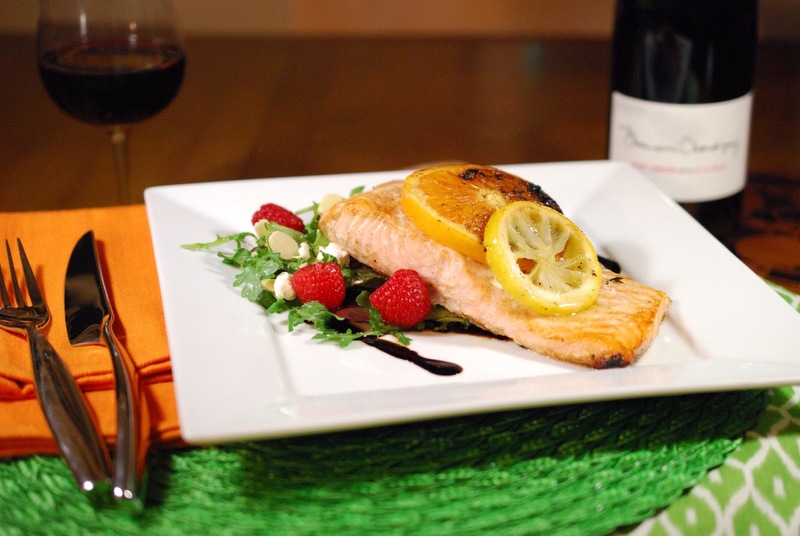 If you’d like to pair another red with this salmon the key factors are to focus on finding a wine with medium minus to light tannins that won’t class with the fish. Bright acidity will also help the wine stand up to all the citrus in the dish. A lighter Pinot Noir would be an easy swap. A number of white wines should also work easily with this dish. You can definitely head toward to the fuller end of the white spectrum, but be sure to pick something with a lot of freshness. If you try a pairing you love, please share! Serves 2. Timing: Less than 30 minutes. 1. Preheat your oven to 475°F. 2. Drizzle a roasting pan with a little olive oil then place the orange and lemon slices in the pan. Dollop butter around the pan, reserving just a pat. Sprinkle with a little bit of salt. Put the pan in the oven for the butter to melt, about 1 minute, making sure to keep an eye on it. As soon as the butter has melted and has stopped foaming, remove the pan from the oven. 4. Season the salmon with salt and white pepper. Place the filets on top of the citrus slices—the slices will help keep the salmon from sticking to the pan. Dab the fish with the remaining butter and toss a few sprigs of time both on top of the salmon and in the butter. Return the pan to the oven. Roast until the salmon is almost cooked through, about 6 minutes. 5. While the salmon cooks, prepare the salad. Combine the orange and lemon juices with ⅛ to ⅓ cup of olive oil (depending on how acidic you like your vinaigrette), with a pinch or each white pepper and clove, and salt to taste. Whisk together or shake together in a jar to mix the dressing. Gradually drizzle on the mixed salad greens in a bowl and toss until the leaves are lightly coated. Sprinkle on the raspberries, goat cheese, and the almonds. Set salad aside. 7. Drizzle a scant amount of the balsamic glaze on each plate, followed by a small mound of salad. Add a filet of salmon to each plate and top with roasted citrus slices. Serve. Photo credit on all photos to Greg Hudson. In more romantic news, today Greg and I are celebrating our 10th wedding anniversary! We will be going out to celebrate for this feast. As well, this month the French Winophiles focus on L’amour– French wines with a name or concept reminiscent of love. We'll be meeting on Twitter to discuss tomorrow, Saturday, February 17th at 11 am EST/ 8 am PST. Join us there by using #Winophiles. The perfect Valentine’s Day plate - colorful and appetizing! Sounds like it was a great match for the Saint-Amour, itself as charming as could be. Thanks for sharing your recipe. Thanks Lauren! It really was lovely! Love this pairing. Works on every level. I love that you paired this red with Salmon. 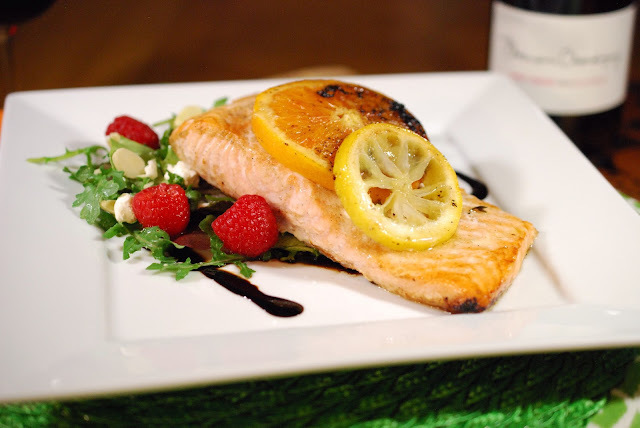 I still have this bottle waiting to be paired and I think the citrus salmon is a great idea. Let me know if you try it! And Santé! My kind of light dinner and salmon is always a favorite. Nice pairing with the Saint-Amour! Cheers! You're so right: easy and light go well with romance! Looks like a delicious pairing with Saint Amour. Your posts always impress me, Nicole. As a resentful vegan who does eat fish, this pairing really appeals to me. Cheers! Cru Beaujolais has it all! I’m convinced there is a bottle for nearly every pairing. Ah, true love! Congratulations on your anniversary! And thanks for all the great info about Beaujolais! This wine sounds fab -- will have to keep an eye out for it! Thanks so much for the Congrats! It was a really happy day. Happy Anniversary!! Great pairings for Valentines or any romantic evening. The Salmon sounds and looks delish.